Similar results are obtained whether or not the corpus is restricted to English or American English. Yet another proof by Google…. According to Wikipedia (that fount of secondary knowledge), the OED lists both collectible and collectable as equally valid spellings. So, on the faith of this graph (which shows percentages of the corpus, not absolute counts), neither was of much note until around the late 1820s (collectable having a slight edge in the teens). Collectable then held the lion’s share until around 1875 and thereafter collectible has stolen the show. This suggests that neither is “correct”, but that collectible is certainly more popular now (by a factor of almost 3x) – at least in Google’s corpus. And that Americans, apparently, had an earlier interest in collectables than the Brits did. Now I am somewhat troubled by the Proof by Google that I’ve just stumbled upon. I have just released pySpaceFighto! as free software under GPLv3. pySpaceFighto! is a two player, 2D vector graphic space fighter game inspired by the old arcade game space war. This is a belated Christmas present to the world, which I had originally worked on in the third quarter of 2011. I had intended to release it at the OSDC lightning talks that November (and again in 2012 – but the lightning talks seemed to have disappeared last year) but I hadn’t completed the splash screen and there were a few bits and bobs to be cleaned up. So, in the intervening year I ended up doing… practically nothing at all (I did manage a splash screen). I decided it was time to let it free. The game has no sound (oops!) and no AI – strictly 2P only. 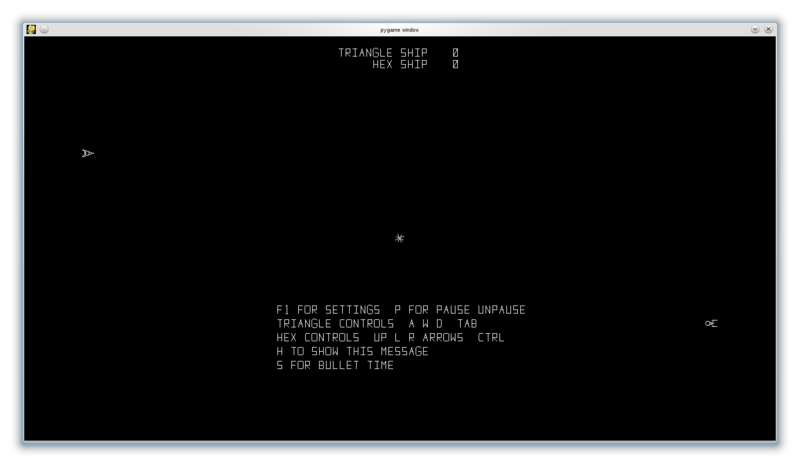 However, it does come packaged with a basic vector font and some routines for designing your own ships (honest) if you’re that way inclined. I have played it with the resident games expert in the family and we thought it was hilarious. Source code is available here: Sourceforge. Pygame is a dependency, so it must be installed to run.